This course will provide the culinarians with an overview of fundamental cooking methods and theories through lectures, discussions, demonstration and production exercises. An emphasis will be placed on the selection of appropriate ingredients, equipment and techniques. Products will be compared, evaluated and critiqued to demonstrate cooking techniques that are most appropriate to specific applications. This program is divided into four major topics: dry heat cooking with fats and oils; dry heat cooking without fats and oils; combination cooking methods and moist heat cooking methods. Knife Safety – Superior knife skills are at the core of any chef’s success; learn proper knife selection, sharpening, sanitation and safety. Vegetable Cuts – Learn all the classical knife cuts including Julienne, Batonnet, Dices, Brunoise and more; make your vegetables look better, cook more evenly and have greater nutrient retention. 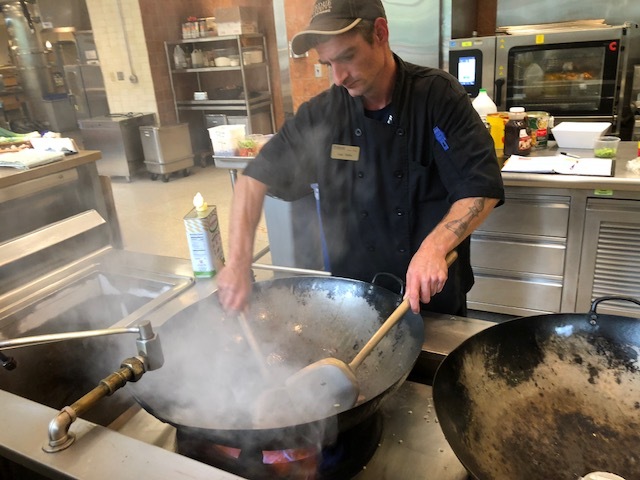 Sanitation and Safety – We enforce the state and local health department rules and regulations and work with all of the culinarians to further explain the correct methods. Team Building – Culinarians will be working on communication and team building exercises. 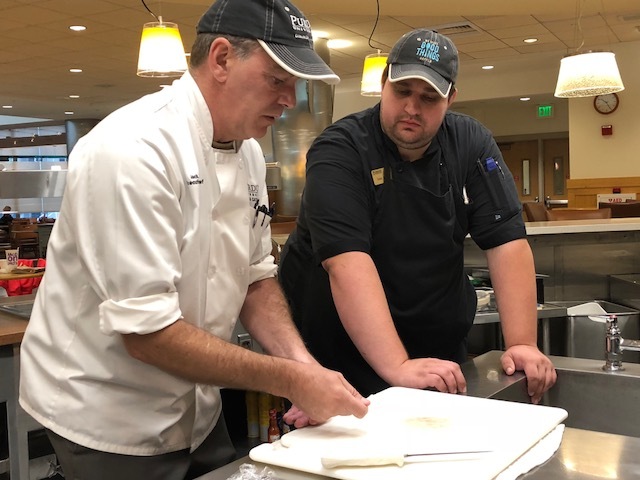 Gold-Standards – Culinarians will learn what each of the “Gold Standards” are for each of the cooking methods and how to taste and season their dishes for optimal taste and quality. Plating and garnishing – Culinarians will learn techniques on how to serve their dishes in a modern presentation and finished with an appropriate garnish. Culinary Principles/Foundations is our flagship training program. This program will access and evaluate the basic skill levels of your culinary staff. This course will also help them polish all of the information they have learned throughout their culinary careers. This training course can be customized to a 3 or 5 day training program for 10-30 culinary staff. Chef Jud Flynn has done it again! He has come to campus for the second time and wowed us with his knowledge and expertise. 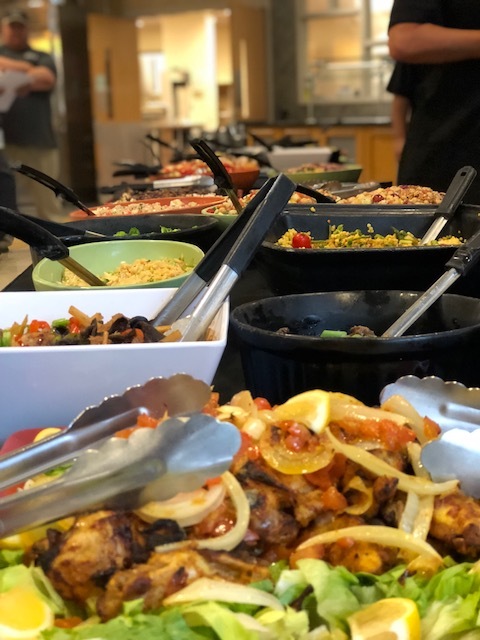 Chef Flynn’s Culinary Foundations class was a perfect fit for our upper level cooks. Each of our cooks were challenged and found interest in the information that was conveyed by Chef Flynn. 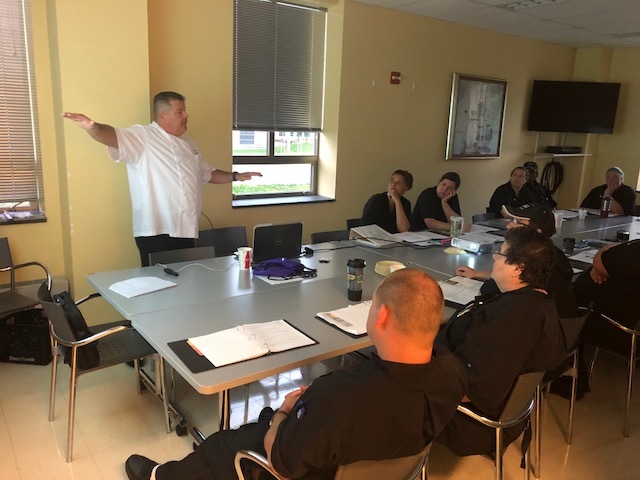 From working with contemporary recipes, to receiving lectures on classical techniques, our staff was able to obtain working knowledge that adds greatly to our training mission. We are pleased to work with Chef Flynn. He is very flexible and customized our training based on staff knowledge and adaptability. The benefits were measurable. We recommend this course for operations interested in introducing solid cooking techniques and overall cooking knowledge for their staff. 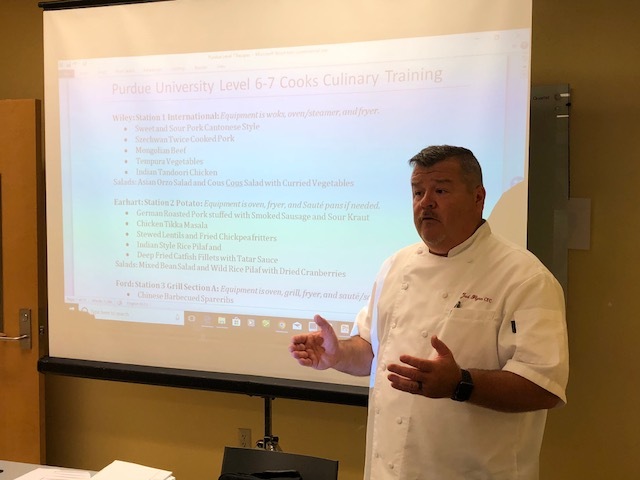 With professionalism and a keen insight for training, Chef Flynn was able to interact with our staff, teaching awareness, precision, and the fundamentals of why we cook the way we do. The process was engaging for our staff. Many enjoyed the knife cuts practice and butchery skill demonstrations. Adequate time was spent on each skill set that was predetermined by the Executive Chef and Chef Flynn. We consulted with Chef Flynn and based our program on standards that we felt were most advantageous for our cooks. Ideas were flowing when we presented the recipe for production. The cooks carried the day.